Boston Modern Orchestra Project/Gil Rose. Rec. Mechanics Hall, Worcester. Massachusetts, on April 1st-2nd, 2002. Lukas Foss' Griffelkin (pronounced 'Grifflekin') rides on the back of the success of Menotti's television opera, Amahl and the Night Visitors (1951). It is in fact an NBC commission. Griffelkin is a little devil (literally) who has a chance to visit the earthly plane on his tenth birthday, there to learn of beauty, death and love. Foss first heard the story from his mother and initially attempted to set it when he was eleven years old. If there are references, as Steven Ledbetter's excellent booklet notes point out, to the Stravinsky of The Rake's Progress, and indeed to Copland, this is very much Foss's show. Foss characterises his players individually. Locations of course get the same treatment, with spookier, darker sonorities for Hell, brighter for Earth. But actually the most magical part of this set is Foss's ear. His use of his orchestra, which sounds quite limited in size, is remarkable. Humour is there right from the beginning when the Grandmother takes the devilish equivalent of a Morning Assembly, calling the imps to 'scowl when I call your name'. She is sung by the fine contralto Marion Day - little-of-wobble and excellent-of-pitch in the disjunct intervallic leaps. It is not all just sweet. If it were the opera would stand no chance of longevity at all. It is all, if you'll pardon the pun, devilishly clever. 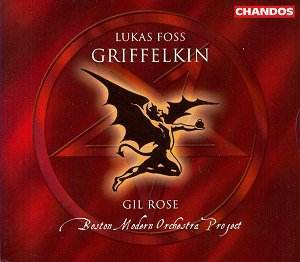 There is a light compositional touch that runs through the whole opera, expertly realised by the Boston Modern Orchestra Project under the baton of Gil Rose. Try the light, piano-dominated dance in Act 1 (also titled 'Prologue'), CD1 Track 4. The Stravinsky of The Soldier's Tale is very evident in Act 2. Griffelkin has been sent to the World for the day. He is in a town square (any town, any country) and meets the talking Statue (Elizabeth Keusch), the chattering letterbox (the clean-voiced Yeghische Manucharyan) and the two lions (who sing in unison). The ill Mother is Janna Baty, who sounds sad, aware of her own mortality, yet who negotiates the tricky part with complete confidence. But it is Griffelkin that dominates. Try the sequence tracks 16-18 where the shadow of Copland looms large. This is involving stuff, and Griffelkin is completely within her part. Kendra Colton's clear soprano gets the role perfectly. There is a happy ending. Because of his good deed at bringing the Mother back to life, he is banished from Hell and has to live as a mortal. He is taken in by the Mother's children. Aaron Engebreth is the appropriately authoritative Policeman. In fact all of the smaller parts are taken to perfection. It is evident that real care has gone into the casting, while the recording is simply superb: Producer Blanton Alspaugh; Engineer John Newton. A life-enhancing project.